Netflix has landed on Samsung's Gear VR headset, and it's both wonderful and slightly disappointing. If there’s one announcement out of Oculus Connect that’s got me excited, it’s that Netflix has finally arrived on virtual reality, courtesy of Samsung’s $99 Gear VR headset. I’ve been waiting quite a while—probably since the first time I sat down in a VR movie theater. While there are plenty of interesting video apps out for both the Oculus Rift and Gear VR, so far they’ve all required importing my own video files or purchasing films. That’s just not how I watch things anymore. I use Netflix. The good news: Whatever technical hurdles John Carmack and Co. needed to overcome to get Netflix streaming to function in virtual reality, well, they solved it. I spent a few minutes scrolling through Netflix’s library and then watching House of Cards yesterday. Aside from the usual complaints about screen door effect everything seemed to work fine. It’s everything around the actual video stream that’s currently underwhelming. 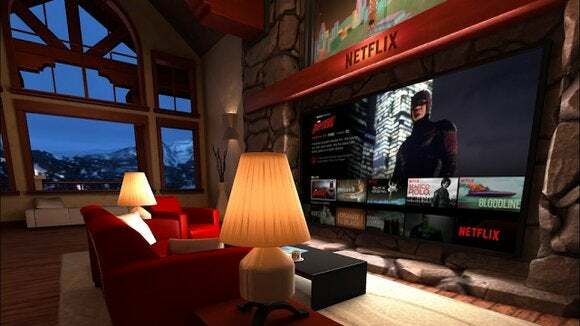 Enter Netflix VR and you’re placed in what Carmack referred to as the “Netflix Living Room,” a weird cabin environment in the mountains with a decently-sized TV on the wall (pictured at top). It’s about as real as reality can get, provided you have a million dollars to purchase a well-furnished cabin in the Rockies or the Sierras or the Cascades, as this Road to VR video of the environment shows. Why there? Why this cozy cabin with its slightly-larger-than-life television? It tells you a lot about Netflix, the company. With virtual reality, the possibilities are endless. But with Netflix, the possibilities end with the sort of TV you’d see in real life and say, “Damn, that’s a nice TV.” This is what Netflix thinks of as “The Core Netflix Experience.” Not a movie theater. Not a movie-theater-in-space. Not a movie-theater-underwater. Not a giant floating screen attached to John Carmack’s forehead. Your only other option thus far is to jump into what Netflix calls the “Void Theater,” which puts the screen in a featureless grey expanse. Quite a few video apps have a similar mode, but here Netflix stumbles by way of lacking core features. For instance, you can resize the screen to make it theater sized, but there’s no way to set how far it is from your eyes. You can’t change the background to, say, black. You can’t change your viewing angle. What’s frustrating is it points to a certain sort of “Reinvent the Wheel” mentality surrounding virtual reality. There are plenty of competent or even excellent VR video apps out there, including Oculus’s own. But Netflix has to have its own app, solve the same problems all over again. Soon we’ll undoubtedly get a custom Hulu app and a custom HBO app and so on and so forth. This sort of Wild West development isn’t always a bad thing. It’s led to some major breakthroughs in VR. But each time, because VR is so new to these companies, we’ll end up with something like this Netflix app—perfectly competent for a first try, but facing the same issues other apps already figured out through years of iteration. Will it improve? Undoubtedly, and I’ll be keeping an eye on it. I’ve been waiting to watch Netflix in VR for a while now—even if I expected something more audacious out the gate.